A surprising amount of New Zealand history – documentary, dramatised, satirised – has appeared on television over the last 50 years. By 2005 – admittedly a stellar year – one reviewer was begging for mercy. Here’s a taste of half a century of history on TV. The documentary The distant shore marks the 50th anniversary of the Gallipoli campaign, a milestone which provokes reappraisal of New Zealand’s role in Britain’s wars. The killing of Kane dramatises a battle in South Taranaki during the New Zealand Wars. 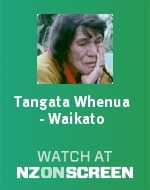 The National Film Unit produces a 13-part series on New Zealand history, The years back. A 60-minute historical drama, Richard John Seddon – Premier, wins the Feltex Programme of the Year award. Pacific Films’ six-part Tangata whenua, written and presented by historian Michael King, is the first in-depth examination of Maori culture on television. King wins a Feltex award for his script. South Pacific Television invests an unprecedented $500,000 ($3.8 million in 2010) on a 13-part kidult drama series, Hunter’s gold, set in Otago during the 1860s gold rushes. This rates well and makes $225,000 overseas, encouraging future productions such as The Mackenzie affair. 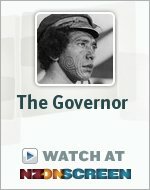 The Governor remains the highest-profile historical drama made in New Zealand. Everything about it is epic: 465 minutes of action, a cast of 500, 20 sets built around the Hutt Valley – and rebuilt after severe floods. Its cost blows out to $1,363,700 ($9.1 million in 2010). The Governor rates through the roof, thanks in part to Corin Redgrave’s portrayal of George Grey as a cross-cultural womaniser. It also conveys recent scholarly findings on many aspects of New Zealand race relations to a primetime audience. Pioneer women brings research on New Zealand women’s history to life in six 30-minute episodes. Subjects include Waikato’s Princess Te Puea and early Pakeha feminist Ettie Rout. Three more episodes screen in 1990. The seven-episode historical drama Hanlon, based on the life of the nineteenth-century Dunedin lawyer best known for unsuccessfully defending baby farmer Minnie Dean on two counts of murder, costs as much as The Governor but makes it all back in overseas sales. New Zealand: an immigrant nation examines the history of this country as a nation of migrants. Seven episodes screen over three years. The six-part series New Zealand at war documents the country’s experience during the Second World War. The primetime audience approves but some historians do not. The game of our lives is, of course, rugby. This four-part documentary views New Zealand's social history through the lens of the national sport. Paul Gittens is a suitably sombre host for the low-budget series Epitaph, which explores the lives of nineteenth-century New Zealanders through their gravestones. Further series screen in 1999 and 2000. Historian James Belich, an animated presence on screen, fronts The New Zealand Wars. This five-part primetime documentary series adds cutting-edge computer graphics to narrative techniques first seen on New Zealand screens in Ken Burns’ US series The Civil War. Belich’s views on the course and outcome of the wars provoke lively debate. The eight-part New Zealand Wars-era melodrama Greenstone is conceived as a co-production with the BBC, which explains its oddly ahistorical nature. Few bodices survive unripped. Our people, our century tells the story of New Zealand’s 20th century in six thematic episodes. Pioneer house introduces a nice Pakeha family to horses and long-drops, and New Zealanders to the new genre of historical ‘reality’ TV show. At 13 hour-long episodes, Frontier of dreams, an overview of New Zealand history from Gondwanaland to genetic modification, is the largest-scale documentary produced in New Zealand. Like The Governor, it has been five years in the making. One reviewer describes it as ‘relentlessly informative’ and ‘pitched at a bright fourth-form class’. The unauthorised history of New Zealand, a satirical documentary series narrated deadpan by Jeremy Wells, hits our screens. It will run for four seasons and 28 episodes. Among the show’s dubious highlights is a mock-1920s cartoon series drawn by Anthony Ellison, ‘Happy Hori’. Yachtsman Russell Coutts ranks 94th, while actor Russell Crowe edges out painter Toss Woollaston for last place. The four rugby players chosen are outnumbered by five scientists. Colonial house puts a bicultural spin on the historical reality show. Any historian of the 1850s could have told them things wouldn’t go smoothly. Beneath the Maori moon is a 15-part documentary series on the history of Maori rugby. Based on Malcolm Mulholland’s book of the same name, it tries hard to set the sport within a wider social context but suffers from a shortage of archival footage. Waitangi - what really happened screened on TV One on Waitangi Day (6 February). The docu-drama is well-researched and provides an entertaining take on the events that led to the signing of the Treaty of Waitangi in 1840. 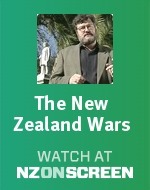 See it on the TVNZ Ondemand website. We have 4 biographies, 1 article, related to Television in New Zealand.